Fully equipped kitchen, including dishwasher! All cabins come with a modern kitchen with stove, fridge, microwave, toaster, coffee maker, dishes, pots & pans, utensils and more. Except soaps, kitchen and bath towels. All units are Non-Smoking Cabins. 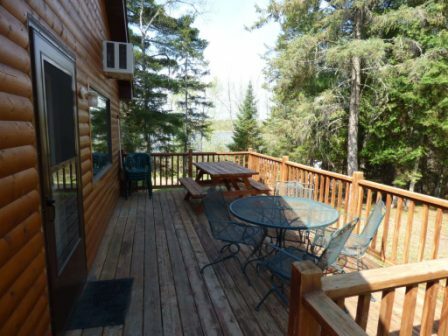 Late Summer Special: 25 percent off week cabin rental August 10th to 24th (Percent off cabin only)! *Peak summer 3 and 4 night specials need to start or end on a Saturday unless last minute. Persons 0, 1 and 2 years old: Free but still count as a person for the Max. Occupancy in the cabin. Deposit for 3 or more cabins: Add an additional $100 per cabin to deposits listed above. All Lodging is subject to 6.875% state and 3.0% local taxes. Crib and High Chair use is Free. We accept Visa/Mastercard (3 percent fee added), Cash, Personal or Cashier’s Checks, & Money Orders. All amenities available as best as possible. Watertramp typically put in for last week of June thru 3rd week of August depending on weather. Not guaranteed. Minimum 2-night stay. Offer good during above dates only. Call 1-218-832-3774 or 1-888-848-7407 and ask for the 2 Person Escape Special!! Daily Rates: 2-night minimum stay is required. *An Extra Person Charge (ages 4 to 100) of $100/week or $20/night is added for each person over the number included in the Base Rate up to the maximum occupancy of each cabin during Spring & Fall. Persons 0, 1, 2 and 3 years old: Free but still count as a person for the Max. Occupancy in the cabin. Deposit for shorter than full week stay is $300 per cabin. Daily rates require a 2-night minimum stay..
*An Extra Person Charge (ages 4 to 100) of $125/week or $25/night is added for each person over the number included in the Base Rate up to the maximum occupancy of each cabin during Hunting Season. Kids under 4 are free, but still count as a person for the Max. Occupancy in the cabin. Day Visitor Charge: Adults and Youth, $10. Children 4 and under are free.